Coaster Photo: This horse drawn carriage (above) and a linotype machine (pictured below) are being donated to the Asbury Park Historical Society by the Gannett Corporation, publishers of The Asbury Park Press. It’s been more than 100 yeas since a horse-drawn carriage made its way through the streets of Asbury Park delivering the local newspaper. But thanks to the generosity of the Gannett Corporation, publishers of The Asbury Park Press, the carriage may soon return to Asbury Park. 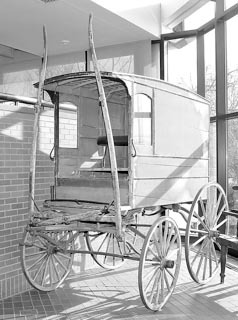 The carriage, which dates to 1879 and was used to deliver the Shore Press, the forerunner of the Asbury Park Press, has been on display in the lobby of the Press building on Route 66 in Neptune, but the Press is moving to a new building and needs to find a new home for the carriage and some other memorabilia. Stine suggested putting the carriage on display in the Transportation Center which also houses another piece of Asbury Park history, the Rainbow Room sign that hung on the former Albion Hotel. The Historical Society spent $15,000 to restore the sign . “A public area like the transportation center is the perfect place to display these items to be enjoyed by everyone,” Stine said. Kathleen Abatemarco, Senior Human Resources Manager for the East Region of Gannett, says the carriage “is a neat piece of history,” and noted that the wheels still move. She said it was used to deliver the Shore Press, owned by Dr. Hugh S. Kinmouth who sold the paper to his nephew J. Lyle Kinmouth, who converted it into the Daily and Sunday Press which then became The Asbury Park Press. The carriage was stored at a Press garage on Summerfied Avenue until the Press moved from the city in 1986. Abatemarco of the Press they will make a presentation to the City Council at its December 17 workshop session. Besides the carriage, there are some other historical Press items which will be moved to the paper’s new office in the former AIG building across route 66 from the current Press headquarters. A vintage linotype machine is too large for the new space, and Stine has suggested donating it to Monmouth University’s Jules L. Plangere Center for Communication, named for former Press Publisher Jules L. Plangere, Jr. He said that would be the most appropriate place for it.